﻿ Market prices and yields of outstanding bonds, notes and bills of the United States, during ..
Market prices and yields of outstanding bonds, notes and bills of the United States, during ..
v. : ; 36 cm. At head of title: U.S. Treasury Department, Office of the Secretary. 15th uf Jurin" and D-ci.m ecr.... .
..... d o ........................----- -. ..... do .-.- .. -. ---... ... .
15th .if March and September.-..
.....---- do ..... .................. .
15th .,f Felbruary and AuI.lil .. . I t of Februai and August -.. ..- . ing, yields are based on the bid price only. The yields for each issue are computed onl the basis. of a 365--day year. .iS208 5 i'3 i2"-,5 I n :,' 1, 22 I."" 3 i l'iio i? "is *i -,2"., i, ';.f. if i ,;,2"
10 ..... .22 ...... ........ ... ... .. .. .. 1. .. 0 li .. 24 ji I-. .
O.11 3 I 379 I 940 10 302 .. .. .41 3 1i I 71 2 | I.' I i I. 2Lt. 0 09 1 316 .93i 101 07 1 17' i 7r67 I r 2 i321 I II (.. 0 . I Closing price not regularly available. NoT.-Thbroughout this form price decimals ror bonds and notes represent thirty-seconds; s, Sunday: e. closed. Treasury bonds, 34%. Treasury bonds. 4%. Tremry nds Tre bo nds. % Treasury b. bnds 3%. Treasury bonds 3%%. l e ... . .
. + I I. I .. "
] 1 1 .I 1 %2 .i I I' r. 4 % ; l I. r 9 I .1 2 1 1 IL 2. 2 .47 ? . 29 120.09 2.122 2.662 104.04 2.327 2.404 108.06 2. 383 2.497 101.11 2.378 2.402 103.08 2.480 2.518 106.19 2.460 2 55. .II I ........ '.. e 1041 J2 1. Nov 01 11 J02 ........ .
II .... 14 1I .' ',iI .1.141 n t'1 I : 2 1 2'. ',: 1i u .9 _2 (il l''2 i1l Il i crI N 1c i. '; i' 1 2 10 N -e II. LI 101 Ij .d"
S. .. .. .... .. . .
1 1 s I .' [. ..I . NOTE.-Throughout this form price decimals for bonds and notes represent thirty-seconds; s, Sunday; c, closed; neg., negative yield. 17 .. ...... .. .
1 .. .. .. .. .
AI7 I LI lie, I'. iji iui 3h il 3"
101 21 101 21 I r.
"ioi i 4ioi i I i42. Ill 4 t 101 Of. ... i .. .... .
4'll IA Ii! (I .
hLI Ul I In 101 0. 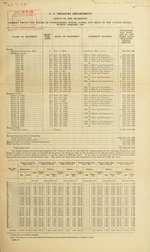 NOTE -Throughout this form price decimals for bonds and notes represent thirty-second. ;: Sunday; c. Closed. m : J I 1,2 I ,,:- ". ^2. I 41.6 llii . '2] ]Ii 2* I l.
4 2. I '"" 2, I 4'"' -i .i,. I -'.._ luu ii 1 l l) 4I 4. 2. I 2r1 1011) ,22 I '1 -2 . S2..1 ll10 .2 .I' 24 4 2 . I n.1 100 I l Li' 2 I 211. 1. '1 I I i Ij. i' 1 I l I J' I I .
i' i 'ii III 1'2 I '13. .c.......... ... ... .. .
.............. .... ... 0 2 .. .. .... ..
3 .............. ..... .. ... ...... .
6 .............. ..2 .: 4 ....... .261. S1 ........ ... ...... I -. ....... .2 . S ........... .. .... I ........ .2. ............. .... ... 2 4 ....... 2. 23 ........... .. 5 ..... 4 .. ... .
23 .... .. I .2 ....... .. .
2, ........ .. ... 5 ..... .. --.. ..:5 ........ .. .
. .. ......... .. ........ .2c 5 ........ '. 3 m LIS... ...... ... .... .... .. ..... ... ..... ... ....... .
." ;' i. ..... ..
1. ............ ....... .. ....... 3.. .. ..... .. .
.. ... . .... ... .
... ......... ...... ....... .. .
S I i ........ 2 .I ... :. S. .........[ ....... .... .
S". .. . .. .. .... . .
4 ... 1 ... 3 . S .. ... '1 .. .
.i .. .. .. .. I' .. .... .. .
2I'............ ... .... 1 M.. ..1. Average i .. ... ..
NOTE.-Througbout this form price decimals for bonds and notes represent thirty-seconds; s, Sunday; c, closed. U 1 GOVERNMENT PRINTING OFFICE. is?